For the bolder of you, I spotted these pictures that are easing me into the mini skirt version of the look, this Topshop skirt is helping too... I love the girl with the simple white tee with her skirt, it looks completely effortless. Albeit a little less practical for our London weather (although I was in Paris last week and nearly died with cold, so we can't complain too much). Saying that, the way the other girl has paired it with her cable knit jumper is just too cute - and her Marant-esque boots are lush. I just got a similar pair from LK Bennett here and I'm a tad obsessed with them. Great post! I'm mad about tartan at the moment. Love the styles of 2 and 3! The mini with the cable knit jumper is perfection. I'm not completely sold on plaid, but this post is making me want to give it a try! 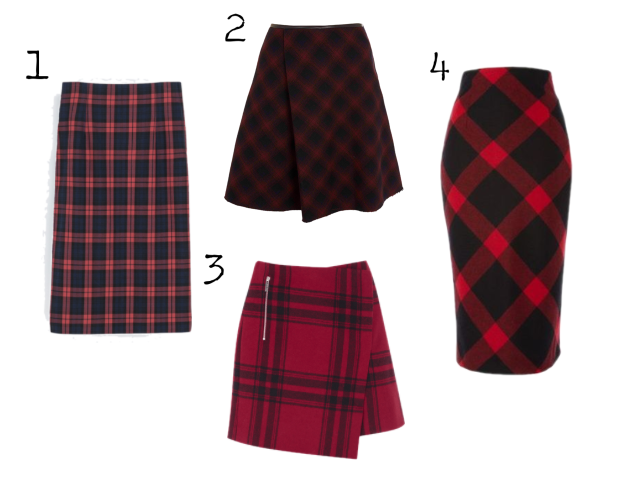 I never thought that plaid could be so cute, I love the skirts.